Renewing our links with Faith Ringgold, whose work is in NMWA’s collection and who was featured in NMWA’s 2013 solo show American People, Black Light: Faith Ringgold’s Paintings of the 1960s, we are honoured to be able to offer a tour of Faith Ringgold led by the 88-year old artist on 6 June at 2 pm (TBC). 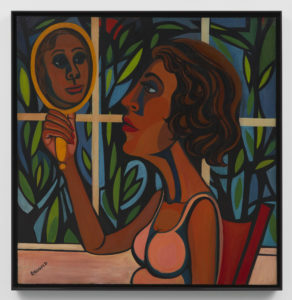 The exhibition is a survey of her work over the last 50 years and first European survey of Ringgold’s work. Ringgold (b. 1930, Harlem, New York) is an artist, activist, educator and author whose work consistently challenges the perceptions of American identity and gender inequality through the lenses of the feminist and civil rights movements. Working prolifically since the early 1960s, Ringgold is recognised for her politically charged paintings, story quilts, prints, children’s books, soft sculptures, masks and performances. She draws upon a wide range of visual and cultural sources, from the traditions of quilt making and its position within the history of slavery to early European Modernism, tankas – richly brocaded Tibetan paintings – and African masks. Priority booking for Patrons. We expect this tour to quickly fill, so are offering our Patrons priority until 20 April. Tour date and time TBC. Please email RSVP@UKFriendsofNMWA.org. Tickets: Patrons – free; Friends – £15; visitors – £25.